Back on May 2, 2010, I participated in bee swarm capture for the first time. The bee colony we captured had lived on Merritt College campus for just under 2 years. Last month we opened the bee box and the entire colony had disappeared. Master Ken told us that the bees were still in the box a week ago when he checked on it. He said there could be many reasons why the bees decided to abandon their hive. There was still a lot of honey left in the hive, which we would harvest as a class and share among us. In addition to honey, we would also harvest the wax, which was regarded even more valuable than honey in the past. The disappearance of the bees troubles me greatly. I have been reading about collapse colony disorder (CCD) since it was first discovered in 2006. I have read that it mostly affects commercial beehives and not beehives that people keep in their backyards. I hope that is still the case. In order to better educate myself in honeybees, I checked out a few books from San Francisco Public Library when I happened to be in neighborhood. One of the book is called A short History of the Honey Bee, which I think is an excellent book for someone who enjoys leisure reading. The author, "E. Readicker-Henderson is a beekeeper turned regular writer and contributor to National Geographic Traveler, Sierra, and others,..." He describes the taste of raw local honey beautifully, which brings tears to my eyes. 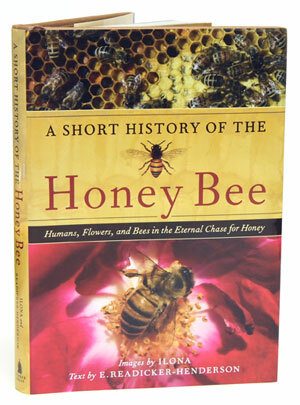 I also looked for documentaries on honeybee and found full episode of Silence of the Bees on PBS.org. From the documentary, I learned that in Maoxian county of Sichuan, China, people have to pollinate their fruit trees because they have lost their bees due to heavy use of pesticide. Can you imagine that? Can you imagine that you can't have an apple unless you pollinate apple blossoms one by one? That is frightening to imagine. I now have a new goal for 2012. For the past year, I grew my basil in a pot so that when winter came, I could bring it indoors. My pot of basil did thrive all year long. With the early arrival of spring, I thought I would take the basil outside to repot it into a bigger pot. I started breaking off some of the long stems with flowers and noticed little black seeds inside of each flower. I was very excited at this discovery and immediately grabbed a little container to collect some seeds. Each tiny flower contains 3-4 seeds. Now it became obvious to me that basil is a self-pollinator since this pot of basil has been inside of the green house most of the time. No bees have come in contact with the flowers. Recently I swapped some seeds with my new neighbor who's also a gardening enthusiast. I got seeds for 3 vegetables that I have never planted before - mizuna, shungiku, and New Zealand spinach. The only one I wasn't sure of is shungiku, so I looked it up on Wikipedia. It is also known as Garland chrysanthemum! Oh no!!!!! I had this before and didn't like it; however, I know my parents like it, so it will go to them. I was surprised by the size of New Zealand spinach seeds. They are a lot bigger than Bloomsdale spinach seeds, which I have planted many times. I looked up New Zealand spinach on Wikipedia, and it turned out to be a leafy ground cover that tastes like spinach. Spinach has always been one of my favorite vegetables, so I have no doubt that I'll like New Zealand spinach. I think I had it once. A guest at one of Master Ken's potlucks brought some leafy greens sauteed with garlic. I liked it a lot and asked her what vegetable it was. She explained it to me and told me that she picked the greens in a park near her house. She told me they were very common in the park. I was very intrigued by it; unfortunately, I haven't ran into that woman again. I believe the dish I had was sauteed New Zealand spinach. I wouldn't mind having the entire backyard covered by it. I also planted a few kabocha, snow peas, and white Lisbon onions. I covered up all the planted seeds with bird netting because I know both birds and squirrels would come steal the seeds. The weather today in the 60's (F), so I will leave the newly planted cell packs outside. I may need to bring them into the green house if the temperature drops again. Bird netting covering the cell packs.